Simple to deploy, the AP5131 Wireless Access Point offers 802.11a/b/g wireless networking flexibility, the latest wired and wireless security standards, and the speed required to support the most demanding applications, including voice and video. The AP5131 is available in two models. The single band radio version that has two antennas. 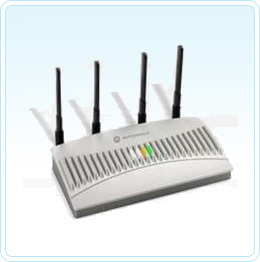 This model is ideal for small businesses and single access point installations. For growing organisations or businesses planning to move to larger premises the dual band AP5131 is a better option since it future proofs your investment. The dual band has four antennas and can be "meshed" which simply means you can extend your wireless network without having to cable into difficult areas. Work "anytime, anywhere" with Java™ web-based graphical user interface; Motorola Mobility Services Platform (MSP); SNMPv3; and command line interface (CLI). Barcode Datalink offers a sealed plastic enclosure with a clear lid (so you can see the lights) that keeps the dust and cockroachs out and from causing you any downtime. For special sites or environments we offer a range of different types of antennas. You should change this straight away and don't forget it. (Keep it in a safe place) Passwords are case sensitive.